I was flipping through my recipe folder for something simple and easy to fix this evening and came across the Linguine with Shrimp Scampi recipe. Unlike other pasta dishes that are served in white or red sauce, the linguine is tossed in a lemon, garlic sauce. 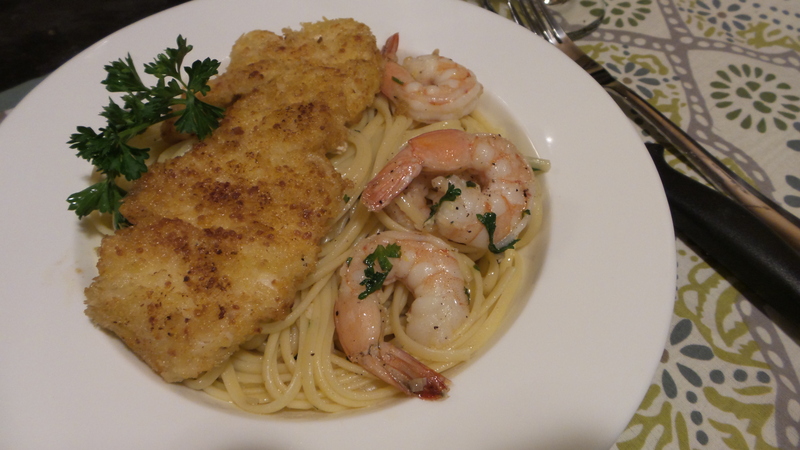 I also fixed some Parmesan Chicken for the special someone who doesn’t eat anything that swims. Our version of the “Land and Sea” pasta recipe is light, delicious, and goes well with the red wine. Slice the chicken breasts and pound each slice to even thickness using a mallet. Combine the flour, salt, and pepper in a large plate. Beat the eggs and water in a second plate. Combine the panko and Parmesan cheese in the third plate. Coat the chicken slices on on both sides with the flour mixture. Coat each slice with the egg mixture and dredge both sides in the panko/cheese mixture until both sides are coated evenly with the breadcrumbs. Heat 1 Tbsp of butter and 1 Tbsp of olive oil in a large saute pan and cook two or three slices of chicken over medium low heat for 3-4 minutes on each side until crust is golden brown. Add more butter and olive oil and cook the rest of the chicken slices. 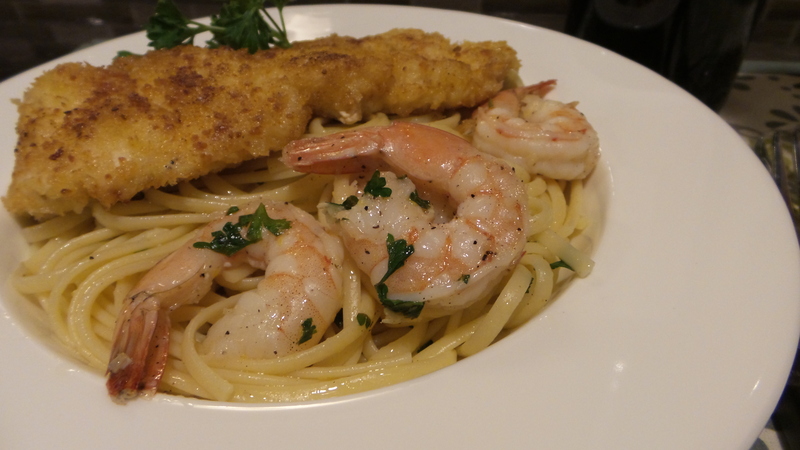 Set aside and keep warm in the oven while you prepare the Shrimp Scampi Linguine. Cook linguine in a large pot of boiling water with 1 Tbsp salt and a drizzle of olive oil. I like mine al dante, do not overcook. Rinse in cold water and drain. Set aside. Melt butter and olive oil over medium low heat in a large, heavy-bottom pan. Add the minced garlic and saute for a minute. Add the shrimp, salt, and ground pepper. Saute till the shrimp is cooked. Remove from the pan and set aside. Add the chopped parsley, lemon zest, and lemon juice. Stir to combine. Reheat the drained pasta in the microwave. Add the pasta to the lemon garlic sauce. Toss till combined. 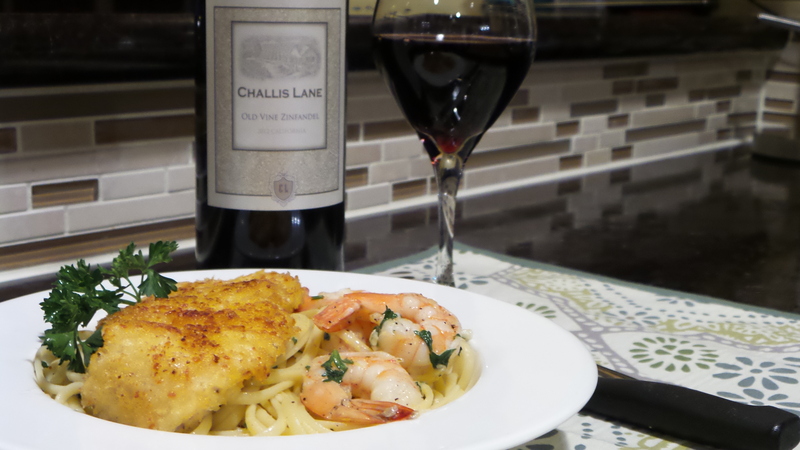 Serve with a slice of Parmesan chicken and a glass of red wine. Enjoy.